In our post about Introduction to WordPress Hooks we saw the differences between WordPress Actions and WordPress Filters, and then in the previous tutorial of this series we learned about using actions in our child theme. So it is time for WordPress Filters now. As we already saw, a WordPress filter modifies the value of something whenever the hook is triggered. And, as opposed to what happened with actions, the final result of a filter is not usually an output because the filter returns something that would be outputted anyway, only that the filter modifies it before it is sent to output (for example by changing the way the text is formatted on a post). What do we need WordPress filters for? But what does all this mean in the practical world, and how can we use and take advantage of WordPress filters? We´ll see it with the aid of some examples. WordPress filters do their work somewhere between the database and the browser, or just the other way around, depending on what the WordPress code is doing at any particular moment. For instance, when the user is searching a blog, WordPress retrieves the applicable posts from the database and, among other things, it filters the content of each post to truncate its length and to add the “read more…” link before sending it to the screen to display the archive page. In cases like this you could think of the job done by the filter as “last minute” editing. Add specific html to particular pieces of data. Change the formatting of text. Modify the way any part of the WordPress data is displayed. For example, que might want to wrap the post title inside a div with a particular CSS class, or add a background to the post excerpts on a blog page, or add a notice at the beginning or end of a post whenever a certain condition is met. All that (and much, much more) can be done by means of WordPress filters. The add_filter function is what we´ll use in order to bind a filtering function ($function_to_add, usually referred to as “callback function” or just “filter function”) to a particular filter hook ($tag). The callback or filter function needs to be fed with the unmodified data (for example, the content of a post) and it must return the modified (filtered) data. So our function takes the post content retrieved from the database (which resides in the variable $content) and, in case the post belongs to the tutorials category, adds the desired paragraph to it. If it doesn´t, the function just returns the unmodified content (because the if condition is not met). But our function must return the data (the post content, in our case) anyway, whether it is filtered or unmodified, for the rest of the WordPress code to use it. This also means that a particular piece of data can be filtered as many times as we want or require. Once we have such a function defined in the functions.php file of our child theme, all we need to do is to bind it to the appropriate hook. The way to hook our new function is, as we´ve just seen, the add_filter function. We just need to add a new line of code to our child theme´s functions.php file hooking our custom filter function to the appropriate hook. In our example we want to modify the content of some posts, so we´ll bind our function to the the_content hook. 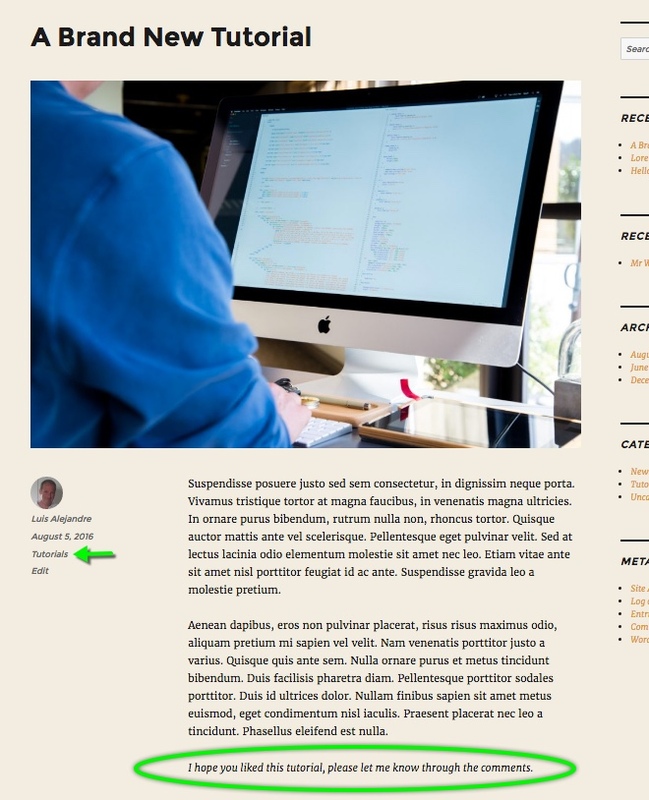 According to the WordPress Codex: the “the_content” filter is used to filter the content of the post after it is retrieved from the database and before it is printed to the screen. On the code above I´ve changed the name of the callback function to something more significant than “function_to_add”, if you noticed. Other than that, the only addition to what we had before is the add_filter line, where we´re hooking our function to the “the_content” filter hook. Now it is time to check whether those few lines of code we´ve added to our child theme work or not. I´ve pasted those lines on the functions.php file of a child theme of Twenty Sixteen on a local dev site, and then published a couple of sample posts, one of them having the Tutorials category. Wow, that was simple, wasn´t it? 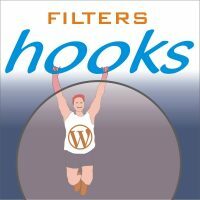 Imagine all you can achieve with WordPress filters! For any other example of application you might think of, you can select your appropriate filter by means of the Filter Reference page on the WordPress Codex. When that point of the code is reached, every filtering callback function bound to that particular hook will be executed, so the piece of data contained in $value (the value on which the filters hooked to $tag are applied on) will be modified by the functions that were hooked via the add_filter function. I hope you liked this tutorial, please let me know through the comments. its nice tutorial specially i learn The add_filter function….. 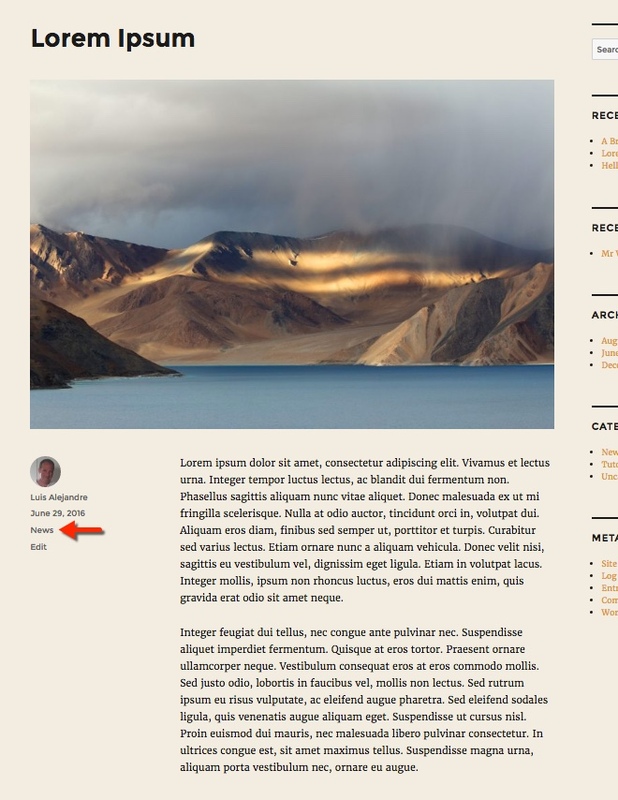 Thank you Luis Alejandre for making a great tutorial about how to add functions a wordpress child theme. As I have a basic knowledge about theme development, I understand your tutorial fully. A bunch of thanks for your step by step tutorial. Thank you very much, very well explained like the subjects of the previous posts. Normally custom code would be overwritten during the next update to the newest version of WordPress. In this is case normally it may affect main files of theme and this is why it is necessary to customize code in child theme so that it can be possible to modify some parts of WordPress, a theme without modifying the original files. This is very nice and useful initiative sharing here such informative article . Thank you for this tutorial. It helps me understand how WordPress Filters Work! Thanks for your great post and tutorials on how to add WordPress filter in your child theme and how it works for you by intercepting data. I hope the whole procedure will be helpful for the users. A lot of thanks to you for making a great tutorial about how to add functions a WordPress child theme. Really it’s a helpful guide for the users.